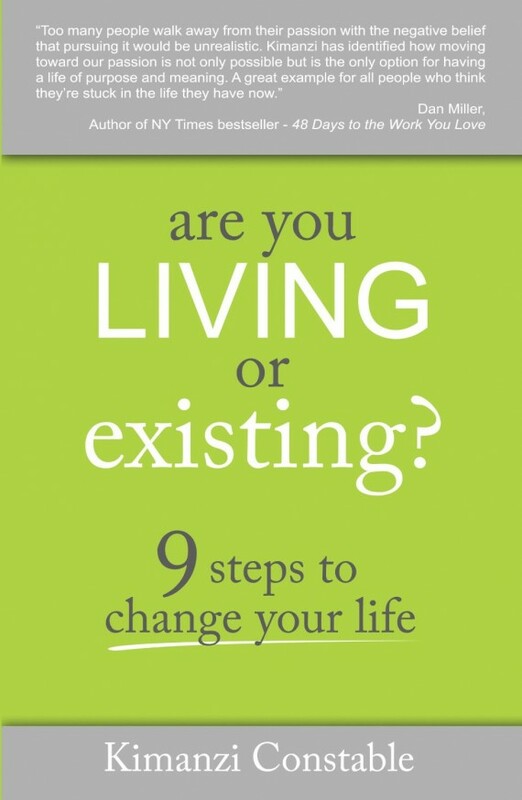 Today my good friend Kimanzi Constable’s book is releasing, Are you Living or Exciting? 9 steps to change your life. If you buy a copy between May 1st – May 19th he’s offering over $100 worth of free bonuses, click here to check out the bonuses and see what you need to do after you buy your copy. It would be crazy to not buy a copy (Just saying). I highly recommend buying the book before May 19th so you can receive all the great bonuses. You can learn more about Kimanzi Constable here. Question: What are you dreams and how are you making progress toward them? I have hit a point where I’m not sure what my dreams are any more. I encourage you to connect with Kimanzi because he might be able to help you. I keep plugging along. My second book is being released today. I have a third in the making. Congratulations Dan!!! Keep it up, your a great example of someone moving toward their dreams. Great dream Micky. Amen to staying on course and trusting God with the results. Those are great dreams Micky. I know your going to enjoy his book!!! His bonuses are going to be a huge help for you as well. Thank you for sharing your dreams with us. Thanks Micky, it’s an honor! I got this one a couple weeks ago! I respect anyone that keeps moving forward. Good job to the both of you. Kimanzi is a great example of someone who persevered and is seeing the great results from it. Hope you enjoyed the book. Thank you for sharing. This is such a great book and Kimanzi is such an awesome guy. This book will do wonders for most that read it. I agree, the book and Kimanzi are great! Thank you for reading and sharing. Great review Dan! and congrats to Kimanzi on it’s launch. I have many dreams : ) My ultimate goal is to help people build strong successful lives through building their capacities. Am making progress..not as quickly as I’d like! But getting there! That’s a great dream! Yes, your making great progress. Can’t wait to see you move further into your dreams. Thank you for sharing. Thanks for sharing this. Based on just the title, I feel like I want to get my hands on it and peruse immediately. Living is different from merely existing. I like self-help and inspirational books. Then your really going to enjoy this book Antonie! Let me know how you liked it once you read it. Great review, Dan. I enjoyed Kimanzi’s book. It wasn’t too heavy, it was easy to read, simple to implement and yet powerful to change lives! I agree, it’s easy to read and relevant content. Glad you enjoyed the books. Looks like you have some new quotes. Enjoyed the way you presented the book! Yep:) Glad you enjoyed the book review. Thank you for reading and commenting. I have plenty of “skinny” clothes in the closet…maybe I need to pull them out as a reminder to get back there! Thanks for the reminder that this is available now – and for the review. Have a great week! Ha, that’s great Tom:) I also need to lose a few pounds so might do the same. Thank you for checking out the review. Dan, thanks for sharing this book, the idea is very inspiring. I know that is always easy to slip into the existing mode but I do believe that God wants us to live rather than just exist! It sure can be easy to slip into exciting mode. God calls each of us to thrive and excel in life! Thank you for reading and sharing. I enjoyed the book review and Kimanzi sounds a like a very inspirational person. I liked the idea of beginning with the end in mind. I did this around 5 years back through writing a cheque to my mum for £10 Million. This was to say that one day she’ll be able to cash the cheque. These days, I’m not really as ambitious in terms of money, but doing this with the cheque has helped to keep me on track with my current financial goals. He sure is, I highly recommend connecting with him. Great example, thank for sharing about your own life. Glad you took the time to read and share your thoughts. I appreciate it. Great review Dan and it sounds like an interesting read. My dreams are all based around my family and we’re working well towards them. Out of debt was the first goal and we succeeded in doing that last year. Thanks Tim. I highly recommend picking up a copy. You have great dreams!!! Basing them around your family is so essential. Thank you for sharing.